/ The end of your walk! 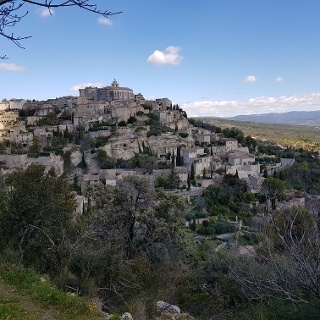 A long but pleasant walk from the town of Gordes to the equally picturesque, but very different town of Fontaine de Vaucluse. 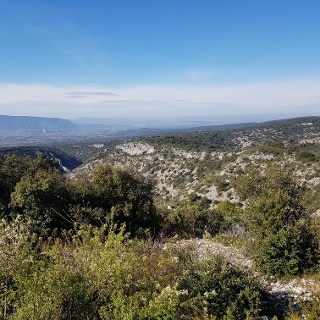 Embrace the feeling of wilderness when following these quiet trails, before finishing in the popular little town of Fontaine de Vaucluse. This walk takes you down into the Senancole Gorge and past the Abbaye de Senanque. You then use the GR6 & 07 hiking trails to climb out of the gorge and along the ridge, before descending into the neighbouring gorges, where the source of the river Sorgue and the village of Fontaine de Vaucluse is to be found. You will be walking most in forested areas, with birdlife and butterflies in abundance, and fine views of the gorges. This walk mostly consists of forest tracks roads, with some sections on quiet tarmac roads. 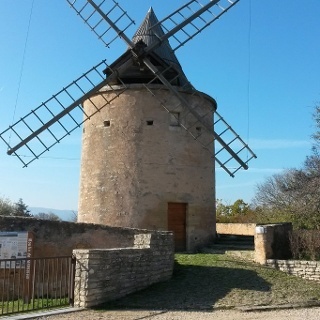 There are some steep climbs, and a long, rocky descent after the halfway mark, before you work your way in the cool shade of the busy tourist town of Fontaine de Vaucluse. The underfoot conditions are good, with some rocky sections. Reward yourself after the long descent to Fountain de Vaucluse with an ice-cream at one of the many river-side cafés. There are some short sections of road-walking today. Take care, especially at bends. The descent into Fountaine de Vaucluse is long and rocky. Take plenty of breaks along the way to rest and refuel. Some may find walking poles useful for the long descent. 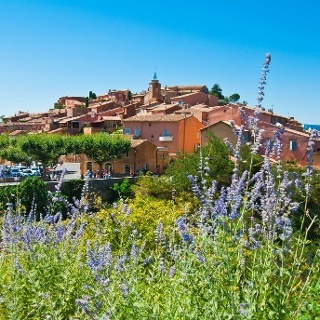 Gordes has numerous independent shops including a couple bakeries and a supermarket where you can stock up for the day. All are on or near to the square in front of the castle. There are no facilities en-route during this short walk, other than at the Abbaye de Senanque, should you choose to visit there. 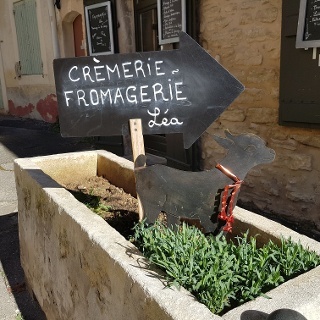 On reaching Fontaine de Vaucluse, you will not be short of options for eating as the town caters well for the huge number of visitors it welcomes over the summer months. We recommend always starting your day carrying at least 2 litres of water per person per day, and maybe even more on particulalry warm or longs days. Provence can become very hot and it is important to stay hydrated. Senanque is a beautiful and still-working 12th century abbey, tucked into an isolated valley north of Gordes. Famous for its lavender fields, and associated craft industry, it welcomes visitors all year round (reduced hours in the winter months). There is a dress code (it’s a working monastery!) and an entrance fee, but it’s a popular attraction and despite being extremely busy during the summer months, offers an atmosphere of peace and tranquillity. More details can be found at http://www.senanque.fr - click “English excerpt“ to the right. Fontaine-de-Vaucluse ("spring of Vaucluse") is built around a spring in a valley at the foot of the Vaucluse Mountains, not far from L'Isle-sur-la-Sorgue. It is named after the spring, the source of the River Sorgue. The fountain, or spring, of Vaucluse, situated at the foot of a steep cliff 230 metres high, is the biggest spring in France. It is also the fifth largest in the world with an annual flow of 630 million cubic metres. The fountain of Vaucluse surges in in March for about 5 weeks, causing regular flooding further downstream, and then subsides. 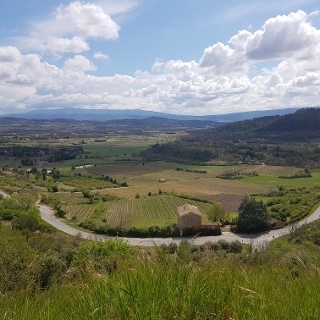 The mechanism behind the surging remains somewhat of a mystery, although the latest theories centre around a subterranean lake, that dramatically swells with snow-melt from Mount Ventoux in early Spring. Other attractions in this pleasant little town, include the castle ruins perched on the cliff, the ancient paper mill (and the associated water-wheels). You may of course simply wish to enjoy a cool drink in one of the many cafes beside the remarkably clear water of the Sorgue River. 0.0 km – START: With your back to the Bastide de Pierres restaurant, and the castle and war memorial statue in front of you, BEAR RIGHT at the roundabout onto the D15 road following the sign for ‘Abbaye de Senanque’. Walk on the pavement/sidewalk where it is available, as the road swings right, then left again. 0.60 km – Come to a paved road. TURN RIGHT onto it and follow it as it ascends gently. Although usually quiet, be aware of passing traffic. 0.80 km - Where you see a dead-end sign (T), BEAR LEFT onto this smaller side road and follow it downhill. 0.90 km – Come to a yellow walkers’ signpost named ‘La Rougiere 379m’. TURN RIGHT onto the rocky ascending path, following the sign for ‘Sénanque’ (1.7 km) and the red/white markers. 1.80 km – Come to another rocky path that intersects the path you are following. BEAR LEFT across it to rejoin our path on the other side. Follow the red/white markers. 2.20 km – Arrive at the top of a slope and a paved road. There is also a yellow walker’s signpost named ‘Cote de Senancole 460 m’. TURN LEFT onto the paved road, following the sign (unfortunately in a state of disrepair at time of writing) for the Abbaye. Follow the road, being careful of any passing traffic. Lovely views over the gorge open up on your left. 2.40 km – There are views of Mont Ventoux directly ahead of you. BEAR LEFT off of the road onto a rocky descending path. Follow this path, taking care as it can often be wet and muddy. 3.00 km – BEAR LEFT onto the further descending path which will take you down to the Abbaye. Even though this path is marked with an ‘X’, you should follow it as it takes you to the abbey, whereas the path ahead takes you straight past it. 3.30 km – Come to the Abbaye. Take some time to explore. When ready to continue, leave from the yellow walker’s signpost named ‘Abbaye de Sénanque 387m’. 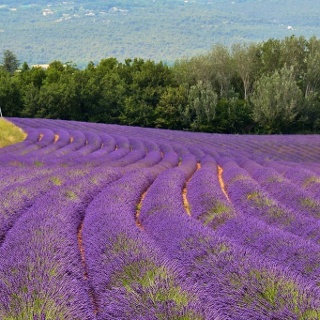 Continue STRAIGHT AHEAD with the lavender fields on your left. Walk through more lavender gardens to reach the car park. 3.60 km – Upon reaching the car park, continue STRAIGHT AHEAD on the paved road out of the Abbaye. 3.90 km – Leaving the Abbaye by way of the vehicular entrance/exit. TURN LEFT onto the main road. After about 20 meters, TURN RIGHT onto the small ascending path. If unsure, keep an eye out for the red/white markers on trees. 5.50 km – Come to another junction in the trail, which is marked by a small cairn (pile of rocks). TURN RIGHT here. Keep an eye out for the next turn in 300m, it is easy to miss! 5.80 km - TURN LEFT, ignoring the path straight ahead. Keep your eyes peeled for the red/white markers. You will then almost immediately join a wider track for a short distance of 50m or so, then take the red/white marked path off to the right. Once you have left this wider track, you will stay on this path for almost 3km without interruption. Please stay on the path, and look for the red/white markers. 6.90 km – the path begins to descend and becomes stony underfoot. 8.60 km – Come to the yellow walker’s signpost named ‘Croix de Pouracon 633m’. Continue STRAIGHT AHEAD through the field for about 100m. 8.80 km – Come to yet another yellow walker’s signpost named ‘La Plaine Est 635m’. TURN RIGHT following the signpost for Fountaine de Vaucluse (7km). 9.60 km – Come to a junction in the path, TURN LEFT and follow the gently descending path. Keep an eye out for red/white markers which are a bit faint here. 10.10 km – Arrive at the yellow walker’s signpost named ‘Lanzas Nord 616m’. TURN RIGHT here following the sign for Fountaine de Vaucluse (5.8km). This is the start of a long and rocky descent. Stay on the path, using the red/white markers for the next 4.5 km. 14.80 km – Come to a junction in the path. BEAR LEFT to continue descending. Ignore the narrow ascending path straight ahead. 15.40 km – Come to a yellow walker’s signpost named ‘Font de l’Oule 116m’. TURN RIGHT here following the sign for Fountaine de Vaucluse (1 km). You will be walking along the road for the next kilometre or so, until you reach the town. Please be careful of passing traffic. 15.90 km – After passing the cemetery on your right, BEAR RIGHT and head down the slope beside the no-entry sign (applies to cars only). 16.00 km – The river Sorgue appears on your left. Continue STRAIGHT AHEAD as the road ascends gently. 16.10 km – Arrive at the tourist office (on your left) and a beautiful old watermill (on your right). This is the end of your walk.